HOLISTIC STRENGTH-BASED, Solution-Focused, MINDFULLY CONNECTING and HEALING, UPLIFTING and MIND/BODY THERAPY. Psycho-Educational, Professional LIFE & SPIRITUAL COACHING and Support for Individuals, ADULTS, ADOLESCENTS, Parents, COUPLES, Pre-Marital, Marriage, and FAMILIES. “It’s not stress that’s the problem; it’s how we take it in, process it, and react to the stress that is. and then bring in new experiences and feelings that will help you grow in a positive way. Breathe, Connect, THRIVE & Inspire. depression, to becoming your integrated and whole, Authentic-Self. We are all connected and can make a difference in other's lives. Helping one person gain insight and growth helps the world. I teach techniques to help you let go of your past, shift your feelings and perceptions as you nurture yourself. We work on being in the here and now to better interact effectively with yourself and others. It often starts with acceptance of feelings and triggers that have become lodged inside to cause anger, resentment, guilt, not feeling good enough, or loved. THEN, learning to honor, nurture, and heal your inner child will help you bring in new positive feelings and helpful core beliefs to let you feel that "everything will be okay" or whatever mantra you need to feel and be inspired by. I bring my teachings from workshops at a local university to help empower clients to incorporate skills and a healthier perception into their lives. You can learn to become more mindfully present and aware of triggered feelings and what to do about them by learning how to mindfully meditate, practice EFT/Tapping technique, visualization exercises, and more. By cognitively learning to become the source of your positive beliefs about yourself can help your feelings and actions too. Becoming mind/body integrated will uplift your whole-self. We practice techniques to create your Daily Empowerment "Resiliency Routine"© ​& "Strength Kit,"© to practice what you've learned. You can Holistically integrate ways to reduce stress, create a stronger sense of self and purpose, and learn how to communicate in ways to mindfully connect to others and the bigger picture. Since the #1 reason people see doctors is stress related, clients also appreciate learning how to be proactive so their emotional stress doesn’t become physical issues. I have been getting referrals from psychiatrists to help their patients who don’t seem to respond well to psychotropic meds or want to learn effective tools they can use daily to help. "I've seen Holistic Mind/Body techniques I teach my clients to cope and cleanse toxic thoughts and feelings, which have been absorbed by the body, pulled out by their roots to activate ongoing healing. This helps to create a healthy mind/body integration and wholeness when one's feelings of their past don't carry the same intensity and triggers that may have caused "dis-ease," addictions, anxiety, phobias, stress, and illness." In your therapy you will learn what psychosomatic stress is, the red flags of it, how it's affected you, and ways to cope with it. You will practice easy and effective ways to empower yourself daily to become more resilient and to strengthen your emotional and physical wellness. Have you ever wondered if therapy and deep breathing could help you become unstuck, let go of suppressed feelings, able to move on and to become free of the tightness in your head, throat, or stomach that you may feel when you are stressed? The Advanced Integrative Therapy (AIT), one technique that I teach clients works well for stuck emotions from grief, need for control, bullying, insecurities, anger issues, and wanting to move on. Any emotions that are deeply rooted from one’s childhood, of how one felt they were treated that is keeping them from moving forward, can be released. It even helps with emotions or experiences from one’s ancestors that people have taken on that they want to let go of. Some see me because their stuck feelings and energy has lead to having very uncomfortable thougths, feelings, and behaviors. Such as, experiencing panic attacks, phobias, sleep issues, addictions, anxieties, or reoccurring relationship issues that AIT greatly helps with. An issue only has to be worked on once to let go of it's intensity and to unblock the energy center associated with it. AIT works by first cleansing the energy center associated with the issue causing the symptoms. Then, with this breakthrough therapy new core beliefs that affect the mind-body connection can be instilled, resulting in a shift that opens positive energy for holistic wellness, insight, and ongoing growth. Click Here To Read My Published Article on Advanced Integrative Therapy (AIT) Learn the process and ongoing profound benefits reported from using AIT. This published article explains the benefits and process of learning and using AIT to shift one's perception and energy concerning mind/body connections to be more positive. Postive and negative experiences, thoughts, and feelings you have taken on can become lodged inside of us. The negative Issues and energy concerning events, experiences, traumas, and triggers can be shifted through our energy centers, Chakras, to encourage healing. This is important since stuck energy, stress, and triggers can cause anxiety, addictions, increased emotional or physical illnesses, phobias, panic attacks, and other stress related disorders. Using AIT can help one pull the negative feelings out by their roots to help one become unstuck and able to move on in a healthier way. Please see the letter testimonials clients and therapists have written about their experiences, and continued energy shifting, with learning this very effective technique that somatically helps transform lives and relationships. By Deep Breathing 3 X's an hour you will nurture yourself by easing your mind and body. Healing starts to happen when you get out of your head and focus on the awareness of your breath and body to heal from the inside out. Watch Dr. Dan Amzallag Montgomery Channel 1 1/2 Hour TV Show on relationships. This episode I was on is called, "Challenges in meeting new people." You will learn many skills and perspectives that could help you in social situations. 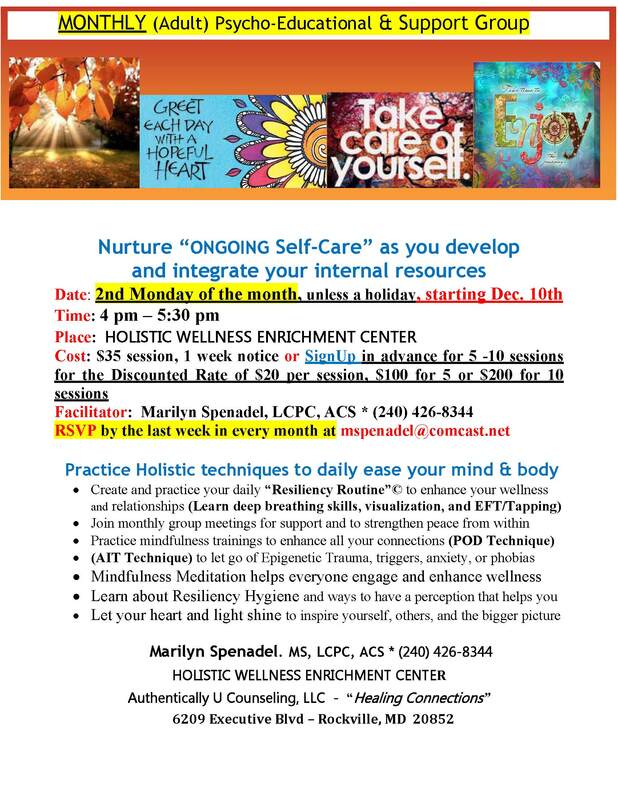 I speak about ways to nurture and work on yourself 1st to strengthen your growth and ongoing insight, as well as, explain how to "Pause Daily" to reduce stress and gain empowerment. 1) Part 1 https://youtu.be/uelUstnTVmg Marilyn explains where negative self-talk and mistaken beliefs come from and how to shift these to positive to help you grow. Part 1 and Part 2: Guest Appearance: Bob Paff, Marilyn Spenadel, and Robert Scuka. Having difficulties in meeting new people? Learn ways to meeting new people and why living in and nurturing your authentic-self is important. Part 2 https://youtu.be/JIczfNgHDRY At the end Marilyn teaches about the importance of using EFT/Tapping to tap away stress and bring in and instill new positive core beliefs. 3) Listen to Marilyn's-AUC's 1/2 hour podcast radio show on "Breathing Stress Away" and Advanced Integrative Therapy (AIT) at www. a moment of change.com. April 9, 2013 broadcast. "You can't always control the world around you, yet you can always change the world within you to help you live in and move in a positive direction." - Federal Government Blue PPO. Payment is expected at time of visit, Thank You! Call for an appointment to plant seeds of hope, to be inspired to find your strengths, and to learn stress management & resiliency skills to help prevent or cleanse any psychosomatic issues you may have. Chronic stress, anxiety and worrying are the leading causes of reasons people go to see doctors for illnesses and angst within. Physical stress caused by mental distress is called psychosomatic disorders, often coming from suppressed emotions, and are very real and should be taken seriously. Incorporating easy to learn mind/body skills to learn to accept and then let things emotionally go in your mind and body, sooner than later, can both alleviate and prevent you from developing stress related illnesses. ONGOING Skill-Building & Discussion Sessions and Workshops to mindfully learn how to live in and "Empower Your Authenticity & Strengths"
Mindfully Connecting with Yourself, Others & the Bigger Picture. How am I connected to the bigger picture? "Ease and Strengthen Your MIND/BODY & SOUL"
NEW OC Beach, Sunset, and Learn to Mindfully "Pause Daily"
Please call for our appointment to have your holistic growth begin. You can have a free 15-minute phone consultation to learn more about individual, couples, group therapy, workshops, and/or professional life and spiritual coaching. (IN PERSON or ONLINE Sessions) Thank you for any referrals. and discovering balance in your life. 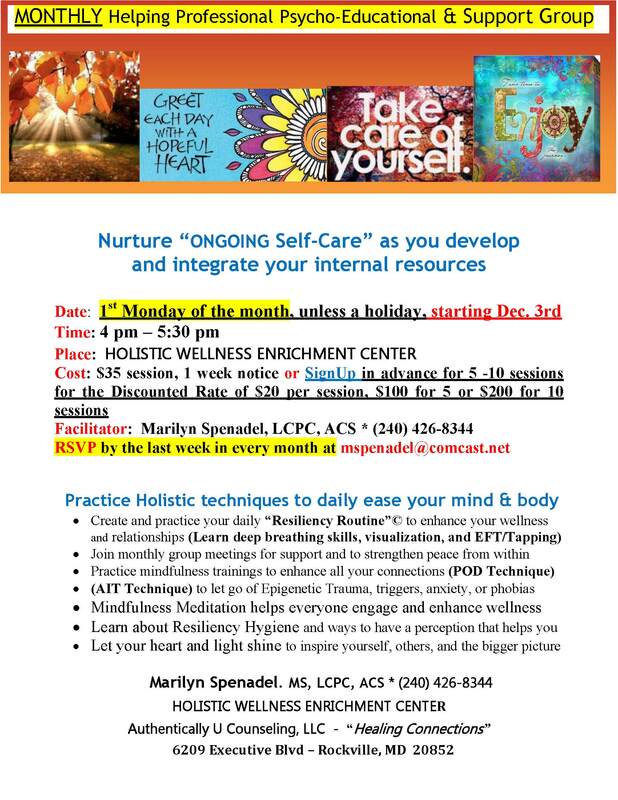 Come Learn Awareness, Healing, and Resiliency techniques to help your mind/body and spiritual connection to stress and how it has affected your moods, emotional stablility, and/or physical illness. Becoming aware of where your stress is inside will promote healing and wellness as you learn to breathe it away and process the insight you will gain about your past and current issues possibly keeping you stuck. Are you looking to find ways to reduce your mind/body connection to stress, become more resilient, or move in a new direction? As a holistic, solution-focused therapist and life coach I specialize in helping adults and adolescents learn how to gain insight and coping skills. While we can't change difficult situations of the past, we can work together to understanding your mind/body connection to any trauma or stress and then learn to cleanse it from your body effectively and easily. By practicing energy healing techniques, you will learn to let go of long-standing feelings and triggers that may be holding you back. You can learn to re-write your story and mindfully live your dreams as your Authentic-Self. I counsel individuals, couples, and families having anxiety, depression, dual-diagnosis, self-esteem, relationship/communication & transitional difficulties. I teach Stress Management, Mindfulness, Meditation styles and techniques, Mind/Body integration, cleansing breath-work, instilling positve core beliefs, EFT/Tapping, guided imagery, NLP, and coping skills. With Solution-Focused, Gestalt, Advanced Integrative Therapy and Existential techniques that best suit you, you can learn to accept your emotions, challenge your mistaken beliefs, understand where they came from, and learn to be the source of your positive self-talk and new core beliefs. You can learn how to use Advanced Integrative Therapy (AIT) breath and energy work to help empower you. Please read my published article on the process and benefits of learning this life changing technique to enhance your energy, self-awareness, self-worth, interpersonal relationships, peace, strength, and living as your empowered authentic-self. You can learn cognitive and somatic techniques to accept and then cleanse your stress within, about a particular incident, stressor, negative feeling, or trigger lodged inside. You can become aware of how your body hears what your minds says and what to do to become cleansed of these thoughts and feelings that are hurting you. You can cleanse any anquish, breathe it away through your energy centers, and move into a positive direction. Then, we can work on you bringing in, and instilling new positive core beliefs to strengthen your emotions and body to become resilient. Please see the testimonials here of how others have healed themselves of their distructive stress within and then brought in positive thoughts, feelings, and energy. I've experienced my approach helping others learn to heal from the inside out as they have practiced their daily proactive "Resiliency Routine"(C) to gain ongoing insight and growth. Definition of Holistic therapy; a term for any treatment / therapy session that is intended to treat the individual as a whole person, on all levels - mind, body and spiritual awareness, healing, and wellness. Most complementary or alternative therapies could be regarded as Holistic. The use of Holistic treatments can be used in conjunction with prescribed medicines. This treatment has been seen, in some cases, to help lower the strength of the psychotropic medicines used as prescribed by the psychiatrist treating the patient. Holistic Psychotherapists and psychiatrists often consult to best treat the patient, if agreed on. As a (ACS) MD board approved clinical supervisor for LGPC or LCPC's I offer HOLISTIC clinical and educational peer supervision groups and/or individual supervision. You can have a Skype or Face Time therapy or coaching session today, from your home or office. or to pay in advance for your Face to Face Session. Learn to Breathe, focus, grow, connect, inspire, and THRIVE as Authentically U! 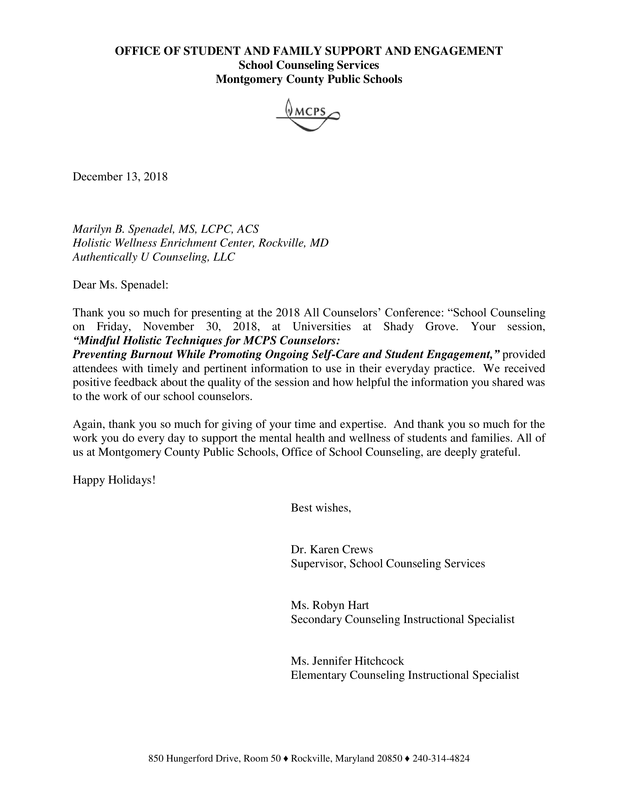 Marilyn Spenadel, MS, LCPC, NCC, BCC, ACS is a Licensed Psychotherapist in MD, Professional Life and Spiritual Coach, and Board Approved Clinical Supervisor. Call for your Free 15 minute phone consultation. office or school,for your convenience. 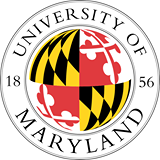 Teens Unlock Your Potential and Discovery "workshops"
Important Forms to fax or email to Marilyn before 1st appointment - NEED 24 hr notice to cancel or reschedule appt. 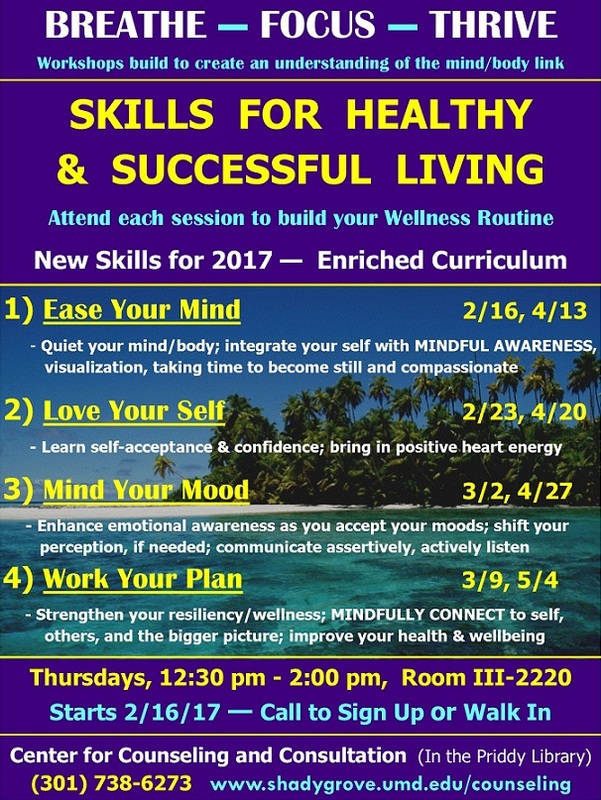 Ongoing (10 or 5 CEU's) "Therapists' Mind/Body & Spiritual Stress Management & Resiliency Skill Building Workshop to prevent burnout"
Licensed Clinical Professional Counselor, Certified At-Risk Counselor, Life & Spiritual Coach, MD Board Approved Clinical Supervisor, HOLISTIC Mental Health Services, Strength-Based, Solution-Focused, Mind/body practitioner. Teaches energy healing breath-work, EFT/Tapping, Meditation, Visualization, Mindfulness, NLP, and (AIT) Advanced Integrative Therapy-somatic mind/body transformation. AS A MENTAL HEALTH ADVOCATE: I teach and help clients and families to advocate for themselves and their love ones in schools, colleges, hospitials, nursing or group homes. I advocate for patients and/or parents of patients who have their family member in a psychiatric hospital, with voluntary or involuntary admission, get the compassionate help they need and deserve. "You shouldn't feel alone, confused, or helpless when you have a love one in a mental health facility or psychiatric hospital." Please call me if you need help advocating for yourself, your love one, or inquiring about mental health therapy or coaching. Chime in with me on Facebook! accept checks or use PayPal. Providing Skype Therapy and/or Coaching, as requested. Just click on the above prompt to get started. your home or work, call for a Skype virtual therapeutic session.